This was published on July 2nd as part of our summer opponent preview series. We're republishing it now because work smarter, not harder, you know? Michigan is 2-1 with a season-opening loss to Notre Dame, 24-17, and two consecutive wins against Western Michigan, 49-3, and SMU, 45-20. The defense ranks fourth in the Big Ten in yards allowed per game (276.3) and is yielding 15.7 points a night (also fourth in the conference). The offense is third in the Big Ten in scoring (37 points a game) but 10th in total weekly output. Michigan has had a better success rate than its opponent in all three games this season. (Yes, even in the loss to Notre Dame; they had a positive postgame win expectancy in that one.) They've lost the turnover battle once, lost the field position battle once and had a worse points-per-scoring-opportunity average once. Each came in the same game. Can you guess which game that was? One of the team's most talented wideouts, sophomore Tarik Black, remains sidelined following a foot fracture suffered in late August. In his place, sophomore wideout Donovan Peoples-Jones has picked up the slack. He leads all Michigan players with 159 yards and four scores. The status of running backs Karan Higdon and Chris Evans, the team's two leading rushers, were both up in the air this week but it appears both will be available to play against the Huskers. Higdon has 228 yards on 34 carries; Evans has another 172 on 30 carries. Both have two scores each. Starting quarterback and Ole Miss transfer Shea Patterson has thrown for 589 yards, six scores and two picks on a 70.8 percent completion rate. The offense hasn't entirely opened up through the first three games, but his assimilation into Jim Harbaugh's system remains a work in progress. The game kicks off at 11 a.m. CT on FS1. This is it. This is the year. Ohio State is reloading; Michigan State is expected to take a leap, but some aren’t sold; Penn State is replacing an offensive coordinator and generational talent in the backfield. Underclassmen made up ten of the top 17 players on last season’s defense. When you have a young unit exceed its own timetable, your margin for error goes through the roof. Ten starters return from a unit that was the most efficient defense in the country a year ago by opponent success rate. First in havoc rate, first in stuff rate and second in defensive passing yards per play… pretty sure that’s how you spell elite. 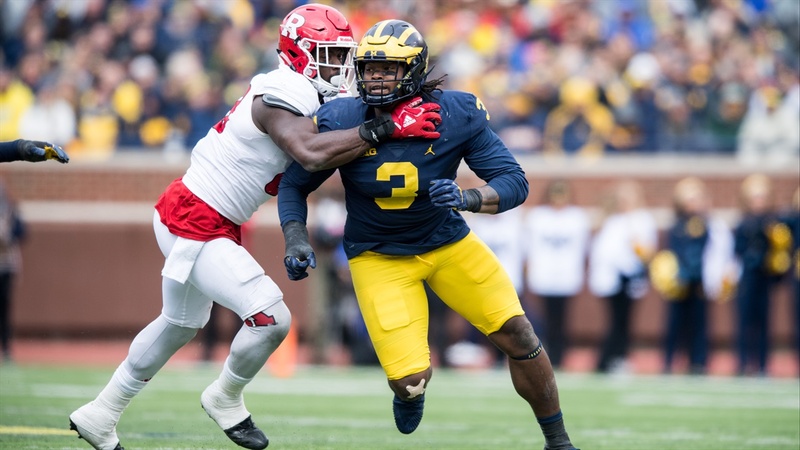 Five defensive players — Lavert Hill (DB), Khaleke Hudson (LB), Chase Winovich (LB), Devin Bush (LB) and Rashan Gary (DL) — recently landed in Sports Illustrated’s Top-100 players in 2018. At home, opponents averaged 98 passing yards a game thanks to a smothering secondary and a front unit that averaged more sacks a game than any other team in the conference (3.23 a game, 42 total). On the road, the secondary turned it up a notch, recording seven of 10 interceptions and 32 of the 53 pass breakups on the season. Three of the team’s top five leaders in sacks also return, along with both starting edge rushers. Remember when Florida had one of the best defenses in football under Will Muschamp and couldn’t field a high school-competent offense to compliment it? That was sort of the Wolverines last year. There were 79 other FBS programs with a better explosive play percentage. There were 100 other FBS programs that sported a better yards-per-play average. There were 119 other FBS programs with a better passing-yards-per-play average. Not quite Treon-Harris-can’t-complete-a-5-yard-out-route bad but still pretty awful for a team like Michigan. Now, injuries were a concern both at the skill positions and at the quarterback spot but Harbaugh has yet to field a top-25 offense by S&P+ in Ann Arbor. Would last year have been different if Wilton Speight hadn’t gotten hurt? Maybe, but in the four games he did play he completed passes at a 54 percent clip and only threw three touchdowns with two picks. There’s also this weird collaborative approach to the offensive coordinator job that is probably going to need to be resolved pretty soon. Michigan currently doesn’t have one single play-caller; just Harbaugh, an offensive line coach, a passing game coordinator and a new wide receiver coach who really likes sharks. So, what changed offensively that puts Michigan in a better position heading into 2018 than it was heading into 2017? You might not be sold on Patterson — the Ole Miss transfer quarterback granted immediate eligibility — or the offensive system in place or Harbaugh’s ability to maximize his quarterback but just in terms of pure talent, Patterson might have enough to overcome the offensive question marks. Here’s more: Patterson led the SEC in passing yards per game (322.7) and averaged a touchdown throw just about every ninth completion, a mark that would have ranked sixth in the SEC among the regular starting quarterbacks. He’s the best quarterback Harbaugh will have had at his disposal, and in Ann Arbor he’ll have a full complement of skill players to work with. Running backs Karan Higdon and Chris Evans are both back. They combined for 1,679 yards and 17 scores last year, 1,039 and 10 touchdowns the season before. Wide receiver will be as stacked as its been: Tarik Black back from injury after a fast start to 2017, former five-star Donovan People-Jones, last year’s leading receiver in senior slot guy Grant Perry and top tight end Sean McKeon. All that points to one absolute must: there has to be offensive improvement in 2018. There just has to be. Modest improvements probably won’t cut it given how much room there is to climb. The actual spots themselves vary but pretty much everyone agrees the Wolverines will play one of football’s toughest schedules next season, so counting improvement by just tracking wins might not be the way to go about things. But on paper, this football team has everything you would want as a head coach, so if Michigan can’t improve, if it can’t take that next step, the problem might not be who’s on the field, it might be who’s standing on the sidelines.